10 solid reasons why we can make a real difference to your next project. Great workspace does not just happen. Ready to start transforming your (clients) workspace: this is how we can help. Here are 10 solid reasons why we can make a real difference to your next project. 1. We’re more affordable than you think. Seriously, we hear this from people all the time; “we though this quality and real design was going to come at a way higher price point” or “when we compared your offering with like products we were pleasantly surprised at the value”. We argue that that is what real modular systems design is supposed to do: make great stuff more affordable, have a wider impact and ultimately help people out. 2. We actually care about your health and wellbeing. Are you sick of smelling the melamine gasses coming off your office furniture? Well you have another choice, you know? 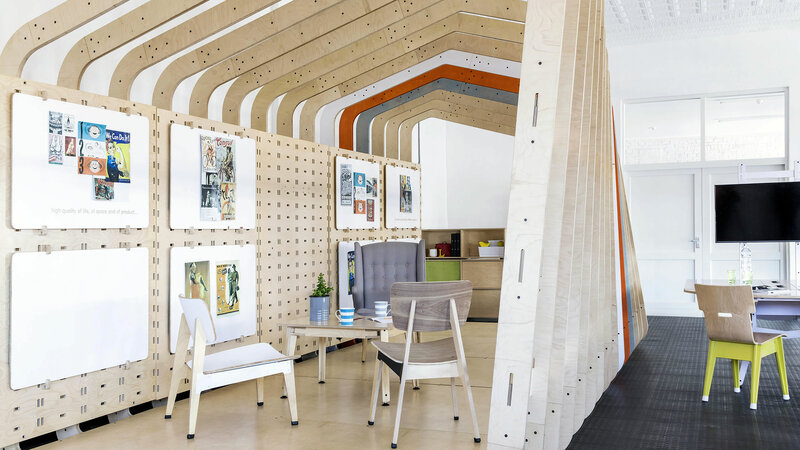 The engineered materials (solid birch plywood) that we employ in our ranges are natural and conform to the highest Northern European standards for health and sustainability. If you would like to know more about how green we really are, please download this short fact sheet. 3. We don’t just talk the talk, we innovate, we don’t just combine, we design. So many workplace design companies talk the talk of collaboration, productivity, team activation, employee happiness and engagement, just to turn around and offer the same old rows and rows of table with pedestal combos and maybe some upholstered pod like structures… wow! 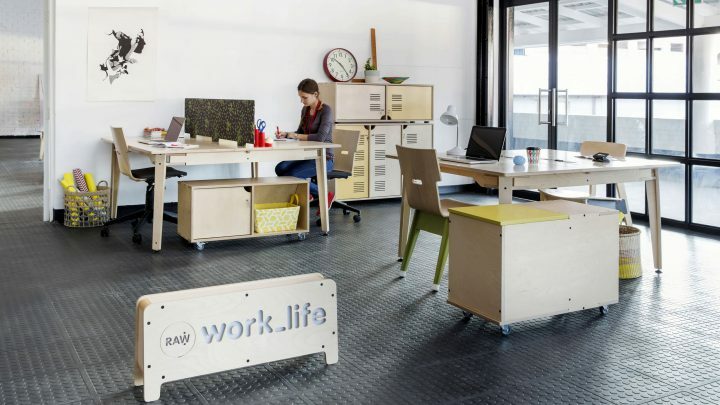 We actually take the time to consider where workspace and worklife is heading and to design solutions to the challenges posed by the changing landscape of work. We consider how “super teams” now operate and what they need and how furniture should not get in the way of great collaboration and creativity, how often mobile workers have become, and how their needs have changed, but also that there is still a large group of employees that simply spend half their lives at the office and deserve to feel comfortable and assisted. 4. We actually give a damn about the environment. Raw is as green as we can make it, not perfect, but always improving. If you would like to know more about how green we really are, please download this short fact sheet. 5. We touch your site lightly. Our systems are modular, flexible, and for the most part free standing. We don’t make dust or any other mess when we install and actually prefer to install just before the client takes occupation. No mess, no fuss. 6. Our lead times are way shorter that most imports or bespoke solutions. Our standard lead-time is 3-5 weeks and we haven’t been late, ever! Many imported or bespoke solution can take three times as long to realize. 7. We are agile, flexible and resourceful. We are makers that are driven by a passion to make better experiences. We have our own prototyping facility where we can fast-track development on specific requests, and on larger projects we can design special apps and solutions. Please see our Customerization blog here. 8. We’re in it for the long solution, (modularity and longevity). Our products last longer. We don’t buy into the throw away culture of “produce cheap and chuck away after three-five years”. 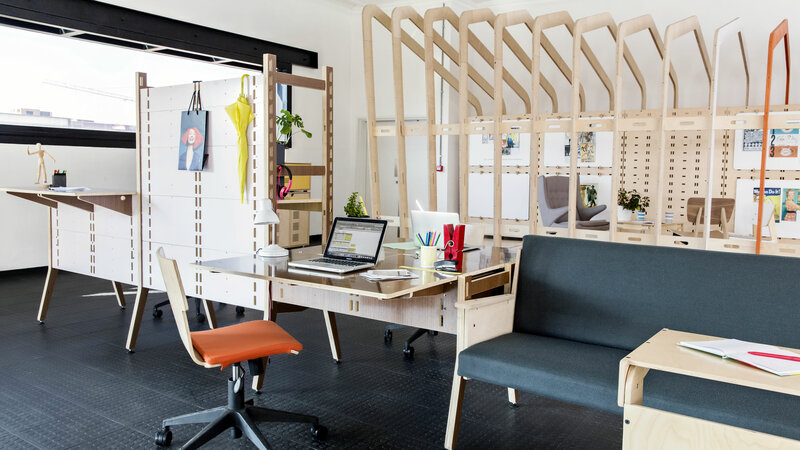 We design and produce modular systems that can be re-configured and serviced from quality solid birch Finnish plywood. 9. We are authentic, with our own design language; we are a great alternative to the generic (yawn) products out there and as a challenger company, we try harder. Yes, we are now often up against the big boys in the industry and because we offer something different to the generic office (you know it… Steel frame and melamine top… realy long yaaawn! ) We have caught the attentions of producers and corporates alike. Clients are not satisfied with the “usual” look, feel and function any longer.